The job seems simple enough at first: go undercover and catch her best friend’s killer. But psychic detective Denieve Knight gets more than she bargained for when she enters Dr. Braeden Frost’s estate as a “housekeeper.” She's supposed to be sleuthing, not falling under the spell of the enigmatic doctor and his irrepressible, hellion of a brother, Xavier. Now after two months of working for the man known as “Dr. Death,” she's entangled in a web of secrets and lies. Each discovery only leads to more questions. Though faced with declining health and a storm of confusing feelings and simmering passion for both brothers, Denieve is determined to uncover the truth---consequences be damned. Yet the truth may prove deadly once she discovers just how deep the rabbit hole goes. PRE ORDER your copy of The Darkest Frost: Vol 2 Today! The Darkest Frost, Vol 1 of 2 (TDF #1) CLIFFHANGER: **YES** This is a two-part serial. Amazon US | Amazon UK When the ghost of her best friend begs for her help, psychic detective Denieve Knight goes undercover as a live-in domestic to catch a killer. She sets her sights on the most likely suspect: her friend’s mysterious employer, Doctor Braeden Frost. Dubbed "Dr. Death" by the press, the notorious hematologist is linked to nineteen other suspicious fatalities—all are former patients. The brooding recluse is a man of many secrets, the darkest of which may be lurking beneath the leather gloves he never removes. The Darkest frost Vol. 1 is the first in a two Vol. series by Tanya Holmes. I LOVED this book. There are some good twists and turns in this book, you think it’s going to go one way and it ends up in a completely different direction. There is a cliffhanger at the end and although I am not a fan of them and don’t usually read books with those kind of endings, I am truly happy that I did read this one. 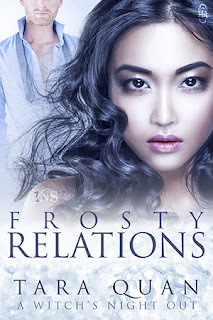 Once Denieve meets her mysterious new boss Dr. Braeden Frost I was hooked. This book not only has steaming hot love scenes but it has twists and turns that will keep you on your toes wanting to know more and you fall in love with the main characters for sure, they each have their own special quality that makes them quite lovable. I think Tanya did a great job with this book and I can't wait for the next one to come out.